Delivering only the highest quality nutritional foods and health supplements, all at great convenience and affordable prices; Nature’s Farm® offers a comprehensive range of health products that ranges from vitamins and minerals, organic produces, sports nutrition to body and beauty supplements. Housed within our retail stores, conveniently located across Singapore are a variety of our very own health supplements as well as a plethora of other popular choices from countries all over the world, including U.S.A., Japan, France, Europe, Italy and Australia. Nourish your skin with the nutrients it needs with Nature’s Farm® SkinPURE+, a premium beauty powdered beverage combining 13 high-performance nutrients (Fish Collagen, Pine Bark Extract, Polyphenol Blends, Antioxidants, Vitamins and Minerals). All of the beauty-enhancing vital substances from SkinPURE+ work together for effective 6-in-1 action to reveal beautiful skin that shines from within: cleaning, repairing, hydrating, firming, shielding and lightening effects. 1. 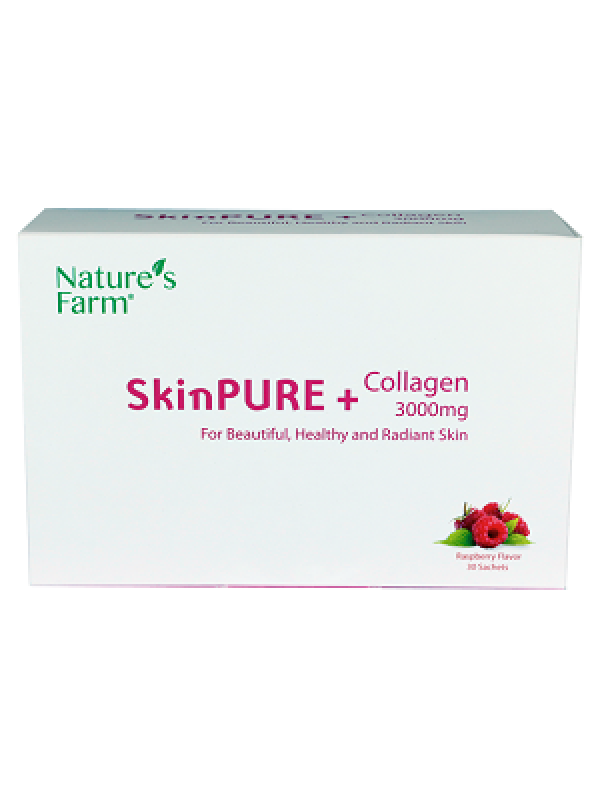 SkinPURE+ is an ultra strong antioxidant-collagen formula. It is added with the well-known super antioxidant Pine Bark Extract and other potent antioxidants, including green tea, apple, red wine, kiwi seed, acerola, selenium, vitamin C, vitamin E and Zinc for synergistic effects. 2. It comes in powder form which can be absorbed quickly.